You have at least five different options for displaying authors using the Multiple Authors add-on. By default, the add-on will display the author box below the content. When you install the add-on, Multiple Authors automatically creates a widget that you can use to show the authors. 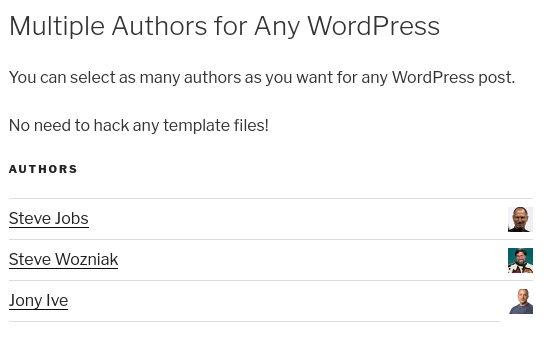 The Multiple Authors add-on allows you to show author details in your plugin or theme. Click here for more details on expanding on this code snippet. PublishPress can modify the default author display. This feature works on some themes, but not all. This mixed compatability is because some theme designers add their own customizations to this author output. However, Multiple Authors also allows you to modify your theme and control the display.